Competitive market conditions in middle market private equity necessitate that firms need to review more investment opportunities to deploy capital. 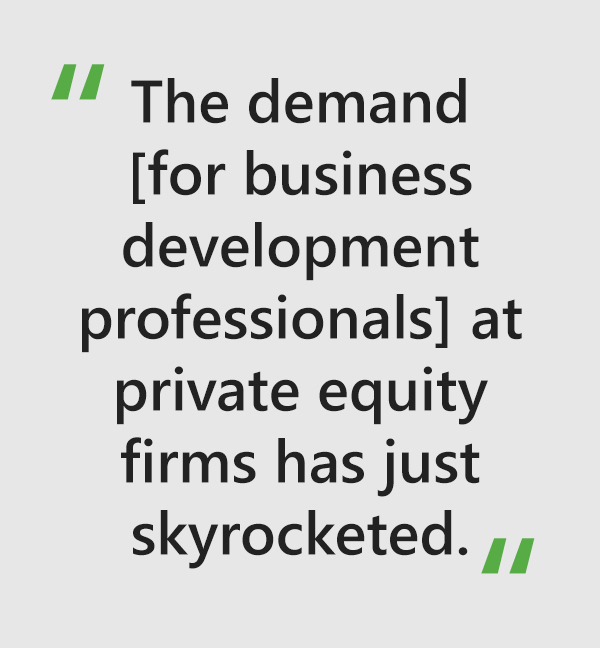 Private equity’s voracious appetite for deal flow has led to the rise of a sales force of business development or origination professionals embedded within each firm. Since the private equity business development function has only recently come to exist, there is a thin talent pipeline to fill these vacancies. Private equity firms are scrambling to staff these positions by repurposing talent from other functions in the transaction ecosystem. In an effort to gain more insight for our private equity partners, Capstone Headwaters' Managing Director Brendan Burke recently sat down with Erin Carroll and Bill Matthews of BraddockMatthews to discuss the development of and current trends in the private equity business development function. Erin and Bill have great insight into the human capital dynamics behind the PE business development function and have placed more people into this role than any other executive search firm. The following is a transcript of the conversation, which has been edited and condensed. CSHW: Can you tell us how you got into buy-side recruitment for the business development deal sourcing function? Bill: BraddockMatthews is a boutique retained search firm that focuses exclusively in buy-side asset management recruiting. We work broadly throughout the United States and recruit both investment and non-investment professionals at the mid- to senior level. Erin and I spend nearly all of our time recruiting for private equity [and] private credit investment firms, across functions, including investment, investor relations, business development, finance, and talent professionals. Increasingly, over the last three to four years, a significant portion of our business has been working with private equity firms to recruit into newly created, as well as established, business development functions. Our first mandate was over 12 years ago, in 2006. Nautic Partners, a Providence based private equity firm, approached us and asked us if we had ever done a search for a business development professional. Of course, we hadn't, but we sort of talked through it with them and we said we'd like to work with them. (Editor’s note: Nautic hired our friend and former colleague Jim Beakey). Since then, we have been actively recruiting business development professionals, and particularly over the last three to five years. The demand for this function at private equity firms has just skyrocketed, and we have been fortunate to work with many firms, of varying sizes, to staff this function across different levels of seniority. CSHW: What's driving the growth of the business development function in middle market private equity? Erin: Deal sourcing has always been critical for private equity firms, and historically done by the senior investment professionals, but the shift to establishing a dedicated function, especially in the lower to middle market, seems to be driven by the increase of capital/funds raised, a more crowded and competitive landscape with many newly established funds, the need for greater quality deal flow, along with creating leverage for the investment team. Firms also want to better understand their deal flow, where deals are coming from and what deals they may be missing. Dedicating resources to this function helps sponsors focus on relationships with intermediaries and management teams, and allows them to maintain a more constant, consistent presence in the market. Erin: Also, as you look at the evolution and maturation of private equity firms, there are other functions that have been staffed in an effort to professionalize the firm and provide leverage for the investment professionals, such as investor relations. I think business development is the next layer [followed by] the capital markets and talent management functions. CSHW: What specific experience sets and tool-kits do sponsors typically seek in business development candidates? Erin: There are three primary characteristics that we lay out with clients, though clients often will prioritize them differently. The first is investment experience or investment acumen: the ability to credibly represent the firm in the market by serving as the first screen and having sophisticated conversations with intermediaries and other constituents. The next is gravitas, or commercial instinct. [Successful business development candidates have] presence and drive and command the attention and respect of others in the market. This naturally leads to having a ‘hunter's mentality’ and strong relationship management skills. All are necessary to be able to best position your firm in the market to see the best deals. The last is the ability to be hands-on, process- and detail-oriented. 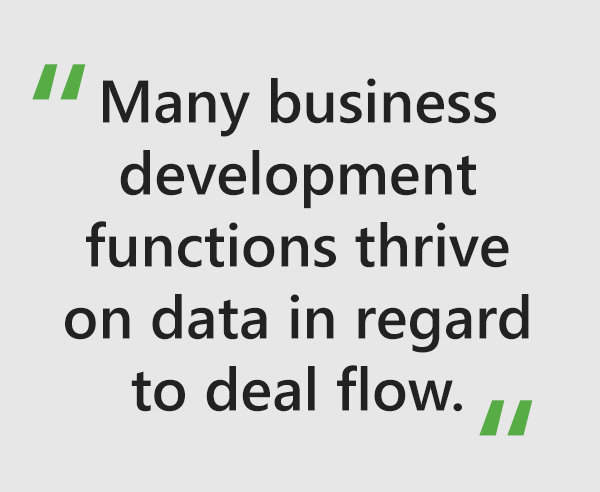 Many business development functions thrive on data in regard to deal flow. Without a strong handle on the data, it can be very difficult to prioritize time and relationships. CSHW: Are the private equity sponsors willing to pay for that investment tool-kit in the business development function? Erin: They are in some cases. I don't think business development professionals need to have investment banking or principal investing experience per se, but some buy-side or sell-side experience is typically seen as a net positive, and can be helpful in establishing credibility in the market quickly. Bill: I would agree. Different firms value [these tool-kits] differently. Rarely, almost if ever, does a firm say, "We need someone with an investment background. This person would have to have been an investor in the past." That's probably not realistic, even though there are some former investor professionals now in BD roles. But a background in finance is often critical, and that analytical piece, I think, is more important to some than to others. CSHW: As this is an emerging job title, there is not a ready made pool of candidates, so is it easier to (1) coax somebody out of an execution job in private equity to do BD, (2) coax an investment banker away from sell-side advisory or (3) hire salespeople from other deal market service providers like software providers, printers, diligence and accounting firms? What has been the most fruitful group of career switchers that you're finding? Erin: The evolution of the function over the last decade, has resulted in real diversity among backgrounds and experiences for those in the role today. We are not typically recruiting investment professionals to this role, and I think most sponsors would shy away from that profile because they want to ensure the successful candidate sees business development as a long-term career option, not as a stepping stone to transition to the investment team. Looking back to earlier searches, most of our candidate pool focused on investment bankers, across M&A, Financial Sponsors and Leveraged Finance. Now, the candidate pool is much broader and there is also more interest in the business development career path, which wasn’t as established 10 years ago. Depending on how our client scopes the business development role and responsibilities, our candidate pool may include current business development professionals, investment bankers, commercial lenders, debt originators, and sales and marketing professionals servicing private equity firms. There are natural strengths to each of these candidate types, as well as varying levels of compensation expectations, which we discuss with our clients. In many of our processes, candidates currently in a private equity business development role typically have an advantage over others. Sponsors value their best practices, development of intermediary (and other) relationships, and the ability to step in and add value Day 1. Bill: In the early days, firms didn't know how to benchmark compensation, because there were only about a dozen business development professionals out there. We were asked to do sort of a back-of-the-envelope compensation survey about eight or nine years ago. Then we did something more formal about three years ago. We invited 200 professionals to participate. Then we did another one this past spring and now the pool had grown from 200 to about 500 in just two years! When we're doing searches now, particularly for a firm that is hiring someone into the function for the first time, it’s pretty common for a firm to say, "We really want someone who has BD experience. We want someone who knows how to put a process in place, keep us disciplined and integrate the role into the overall investment process." Even if they've only been doing it for three or four years at another firm. Erin: I agree with Bill. We hear it that often. Sponsors who are just now hiring their first business development professional don’t often have the luxury of time. They want someone who will be immediately impactful because they already feel behind. Beyond hiring someone who is currently in the seat, many firms look to candidates who are in sales and marketing roles at service providers because of their knowledge on deal flow, how to best track it, manage the data, and how to best position the firm to see as much quality deal flow as possible. CSHW: Are these career switchers having success, making more money and gaining seniority within their firms? Erin: Yes. We have seen many take on progressively senior roles and in some cases they are leading business development for their respective firm. CSHW: Since so much of the deal flow is coming through investment banks and other intermediaries, how important is it to have a pre-baked network versus the ability to hustle and build one? Erin: Client firms that are hiring for the first time definitely value intermediary relationships that can be additive. A business development professional who has meaningful relationships with investment banks and with sponsor coverage bankers, is thought to be able position their firm well in a competitive process. CSHW: Are BD professionals second class citizens in private equity firms? Erin: For the searches we have managed, I don’t think that is the case. Though, I am sure there are business development professionals that do feel that way. As we have seen this function evolve and become a critical role within firms, I think they should be considered valued team members. In many cases, these professionals are the face of a firm and create meaningful leverage for the entire team. This is an area of expertise that every firm needs to continuously improve. CSHW: How are BD professionals measured? The number of teasers and books sourced? The number of management meetings secured? The number of IOIs, or LOIs, that get submitted. Capital deployed? Erin: It varies from firm to firm, based on our experience and knowledge, though we do see many business development professionals being measured, at least to some degree, by quantitative metrics. Most often we hear that firms track IOIs and LOIs, which are good measures of quality deal flow. Some are measured by deals sourced that have closed or overall capital deployed. Personally, I think those are tougher metrics to use for a BD professional, as they typically have no control over whether or not a deal closes or how much capital actually gets deployed. CSHW: Are you seeing BD professionals commanding fund economics beyond just base and bonus? Bill: A Head of Business Development will expect incentives beyond base and bonus and it is most typically reflected in a carried interest allocation. Almost 90% of Business Development Heads are given carried interest. Depending on the culture of carry at the firm, and the seniority of the Head of BD, in a $500 million fund you might see a Head of BD command anywhere from one to three points of carry. Even a business development professional who doesn’t lead the function at a firm often receives carry – almost 50% of these professionals receive carry. CSHW: When you have a prospective private equity firm in your office, do they have sticker shock when you show them your compensation report for BD professionals? Erin: Most often, yes. Compensation is always a factor in hiring into this function. This is a highly competitive market and compensation has increased year over year for this function. Carry is also expected by most who are in the role today, or who are transitioning into the role at a Vice President, Director, or Managing Director level. If you want to hire someone with relevant experience and best practices, there is a cost associated with that. CSHW: Let’s talk about private equity’s favorite topic in 2018, the recession case: in a downturn, are BD professionals more vulnerable, than folks on the deal side? Less so? Erin: If a firm has committed the energy and capital to recruit this center of excellence into their firm, creating a highly visible and impactful player externally and efficiencies internally, removing that person or functional area would not likely be beneficial to the organization. Rather, I would expect firms to think creatively about where the BD professional can add value beyond that specific function, for example, there are BD professionals that actively participate in investor relations and /or capital markets. Historically, we see reductions made on the investment teams, when smaller funds are raised or fundraising is delayed. CSHW: If a fund approaches you with a new search, how often will you coach them to hire at a different level than the initial ask? For example, do firms think that they need an Associate when they really need a Principal- or Partner-level hire? Erin: Firms reach out to us because of our expertise in private equity and our deep knowledge of this function. We always have a very open dialogue about the envisioned role, what we believe to be realistic and what the best fit is for what they are trying to accomplish with the hire. This is a critical hire for sponsors, and likely someone who will be highly visible – externally and internally. We encourage sponsors to think through their top intermediary relationships and consider what their expectations would be. Who does a Managing Director at an investment bank or a CEO want to have a dialogue with? If a client wants to hire a BD professional who will be tasked with building meaningful relationships through ongoing, in person outreach and meetings, whether that is through city blitzes, conferences or other events, this hire will need to have professional maturity, gravitas and presence. Candidly, the firm is not likely to find it in an Associate hire. CSHW: Do you have a perspective on team construction? Bill: There are a lot of factors that go into staffing this function, including the fund size, fund strategy (i.e. buy and build, corporate carveouts), and whether or not others at the firm will maintain sourcing responsibilities. A $500 million generalist fund may be well staffed with one mid-to-senior professional, ideally with some administrative support. We have also seen firms have two to three professionals at similar sized funds – either at varying levels of seniority – or as peers. Firms that employ a buy-and-build strategy or focus on corporate carveouts, typically have larger teams. With larger business development teams – more than two or three professionals – it makes sense for the professionals to have specific geographic coverage responsibility, as most firms do. CSHW: Do you see a trend recruiting junior versus senior business development professionals? Erin: Generally, we see the market trending towards mid-level hiring, either at the Vice President or Director level, especially for those leading a business development function or those in an externally facing role as a team member with specific coverage responsibilities. That level allows sponsors to offer a longer-term career trajectory, future promotions, and greater responsibilities over time, coupled with the expectation that the successful candidate will have maturity, gravitas, strong communication skills, and an ability to build and manage relationships based on their previous experiences. Brendan Burke is an investment banker in the Financial Sponsors Coverage Group at Capstone Headwaters.